Seeing in the New Year in style, two new special edition 5-door Mazda2 models, the Black Edition and White Edition, go on sale in January priced at £12,145 on-the-road. Since its launch in 2007, the current Mazda2 has won over the Supermini segment with its styling flair, engaging driving dynamics and generous equipment specification levels. 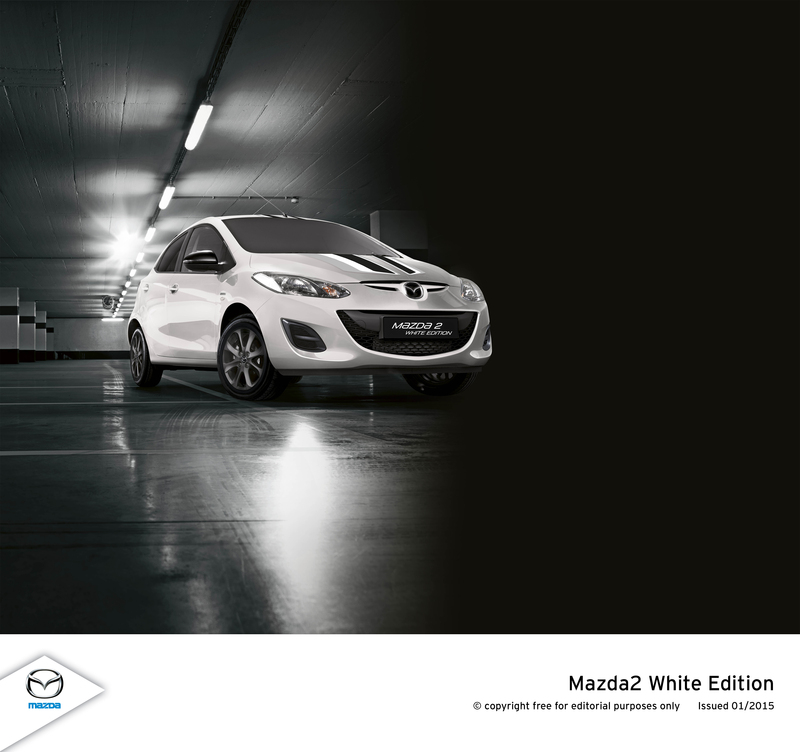 Embodying the model’s energy and spirit, the Black Edition and White Edition bring more than a dash of extra urban chic to the Mazda2 line-up with sporting styling cues and a host of unique specification features. A choice of bold, Jet Black Mica or Crystal White Pearlescent exterior colours is complemented by bespoke, diffuser-style rear bumper trim, a Jet Black rear spoiler and power-operated, heated folding door mirrors, rear privacy glass, 15-inch Dark Grey alloy wheels, unique Black Edition and White Edition badging, and the no-cost option of striking, colour-coded bonnet and roof stripe graphics. On board, that sporting flair is reinforced by body-coloured accents to the door trim and air vents, black cloth upholstery with red piping, glossy Dark Grey audio panel and steering wheel inserts. A lavish, special edition equipment specification includes manual air-conditioning, a CD player with two speakers, USB and AUX connectivity and a no-cost option steering wheel-integrated Bluetooth® hands-free system. The new Black Edition and White Edition are powered by Mazda’s lively 1.3-litre 75ps petrol engine mated to a slick 5-speed manual transmission. And both urban and open-road safety standards are enhanced by the addition of Dynamic Stability Control (DSC) and a Traction Control System (TCS). This entry was posted in Car Updates & Releases, Cars, Popular Cars, Small Car and tagged lease a mazda2, lease the Mazda2, mazda, mazda black edition, mazda white edition, mazda2 by David Petherick. Bookmark the permalink.